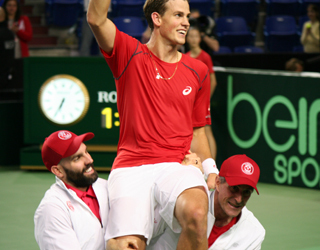 Vancouver, March 8 - Vasek Pospisil celebrates after beating Go Soeda to give Canada a 3-2 victory over Japan. The tie toke place from March 6 to 8 on the Premier Court surface at the Thunderbird Sports Centre on the campus of the University of British Columbia. The Canadian Davis Cup Team included: World No. 6 Milos Raonic (Thornhill, Ont. ), No. 4 doubles player Daniel Nestor (Toronto), No. 63 Vasek Pospisil (Vancouver) and No. 163 Frank Dancevic (Niagara Falls, Ont.). Fillip Peliwo (Vancouver) and Adil Shamasdin (Toronto) will also be travelling to Vancouver with the team as extended squad of players. Team Canada captain is Martin Laurendeau. The Team Japan included world No. 5 and 2014 US Open finalist Kei Nishikori, No. 83 Go Soeda, No. 91 Tatsuma Ito and No. 282 Yasutaka Uchiyama. Canada move on to the World Group quarter-finals and will keep its spot in the World Group for the next year. while Vasek Pospisil lost to Kei Nishikori, 6-4, 7-6, 6-3. 7-5, 2-6, 6-3, 3-6, 6-3.
while Vasek Pospisil beat Go Soeda, 7-5, 6-3, 6-4. Canada's best result is making the semifinals in 2013, when it posted wins over Spain in the first round and Italy in the quarter-finals before falling to Serbia in the semifinals. This tie is a rematch of the last time these two teams met in the first round last year, which Japan won 4-1. The Canadian team at the time was without Raonic and Pospisil in Tokyo because of injury. Canada defeated Italy to reach the Davis Cup World Group semi-finals . . .
Canada upset Spain to reach the Davis Cup World Group quarterfinals . . .
Tsonga lifted France to a win over Canada by beating Frank Dancevic . . .